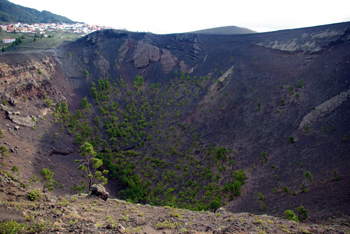 Crater of St Antony’s Volcano. You can see people on the skyline at the right. The most recent eruption in the Canary Islands was Teneguía, in 1971 (see Thursday, 21 February 2008 Which Planet Are You On?). It’s a nice place to visit, but you have to be fairly fit. St. Antony’s Volcano (Volcan San Antonio) is nice in a completely different way. For one thing, it looks like a volcano should look, and you can walk halfway around the spectacular circular crater. You could even get a push-chair most of the way. For another, there’s a car park, and a visitor centre with a café, shop, and a rather good exhibition. The last eruption was from November 13th 1677 to January 31st, 1678. There were earthquakes, sulfurous gases and thirteen lava vents, one of which buried the hot spring that gave the borough its name – Fuencaliente. This left the spa town without a spa, and did the local economy no favours at all. 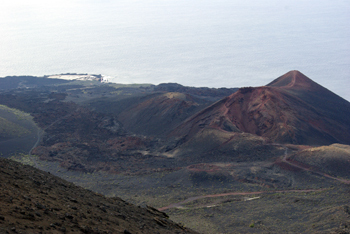 Crater of St Antony’s Volcano looking back towards Los Canarios. If you fancy taking the hump, you can ride a camel along the path for 6.00€. The sign says they start at ten, but when I went there, they still hadn’t arrived at 10:30. So no photo. Sorry. The catch is that you have to pay. The car park is 3.50€ for visitors and 1.75€ for residents, but this includes the visitor centre. Coffee with milk (cafe con leche) was a startling 1.70€. In most places it’s between 1.00€ or 1.20€. So I didn’t try the cake, although it looked good. So does the view from the crater. View from the crater, north towards Las Indias. The easiest way is in a hire car. Take the main road to Los Canarios and follow the sign from the village centre. 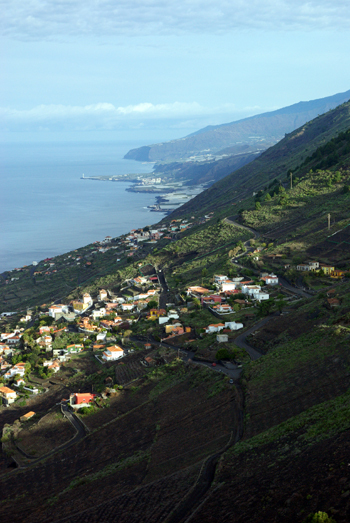 Alternatively, bus L3 will take you to Los Canarios, and you can walk downhill from there (perhaps 2 km). 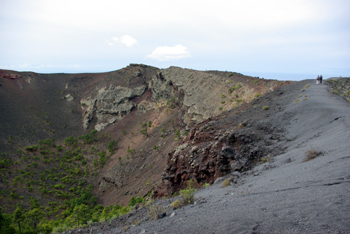 You can also continue your walk from St. Antony’s volcano down to Teneguía and the coast. Bus L31 goes back from the lighthouse to the village.